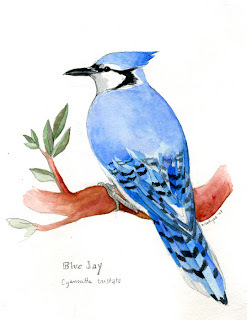 Blue Jays belong to one of my favorite families of birds: Corvidae. Corvids include crows, ravens, magpies, along with all jays. Crows and ravens especially, are highly gregarious birds with somewhat complex social structures. Corvids are also renown for their opportunistic behaviour and unusually (for birds) high intellingence. When I get to prepare a crow or raven, I will use that opportunity to blather on and on about the intelligence of those creatures. Recent biochemical evidence has shown that crows and jays are part of a large evolutionary radiation that orginated from a common crow-like ancestor in Australia. Jays are omnivorous in that they mainly eat insects and mast (nuts and seeds that accumulate on the forest floor). Blue Jays are found in most forest and scrub habitats south of the great Canadian boreal forest. They have a harsh screaming call along with some whistled phrases, and can easily mimic raptors.